I’ve been using Amazon Simple Email Service as the SMTP server for my home lab notifications. I don’t have to worry about setting up my own SMTP server and there is a minimal cost to this configuration. My SES account is set for ‘sandbox’ access where there is a limit to daily email of 200. I sent an email to Amazon Support and they upped the quota to 1000. The pricing schedule says that it’s $.10 per 1000 email per day. I send about 20 per month, so I see a $.01 charge every couple of months. Good deal to me. 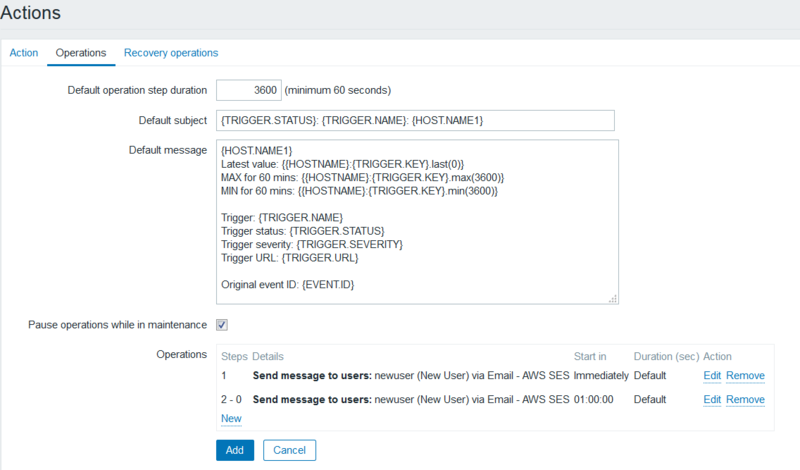 To get this going you’ll have to set up your SES account on AWS. I won’t go into detail, but would do a post if someone wants more detail. Once your account is set up, you’ll need to note the SMTP credentials from SES homepage, then under Email Sending you’ll click on SMTP Settings. Click add to save your config and let’s move on to configuring the new media type for a user. Under Administration then Users, select the user who will be receiving trigger notifications and click the Media tab for that user. 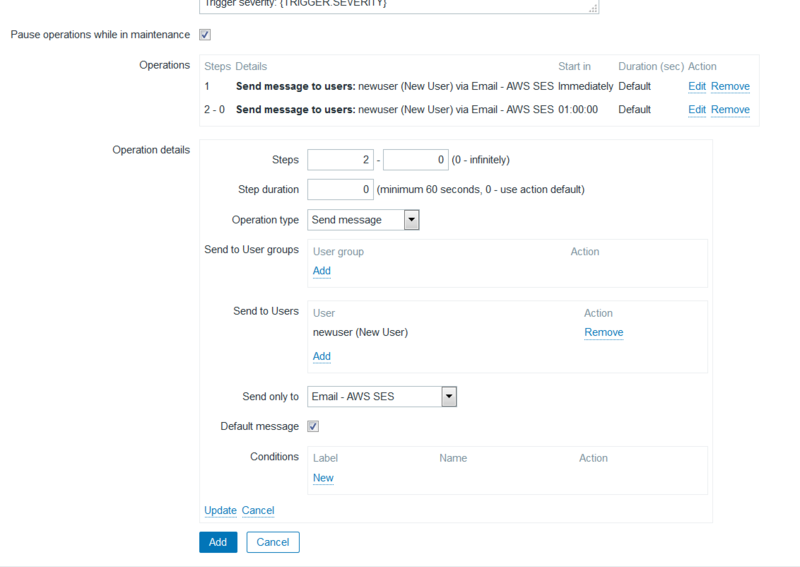 Add a new Media type of Email – AWS SES then enter an email address in Send to. Modify When active and Use if severity if desired. Make sure it’s Enabled, then click Add. Click Update and move on to Configuration, Actions. Make sure the Event Source is set to Triggers. Create Action if you don’t already have one. Enter a descriptive name and add Conditions to the Action. See below for some good starting conditions. These will send an email if a trigger is at least a severity of High. It will also not send email when a host is in maintenance status. Change these to your needs. Once you finish the Action tab, move to the Operations tab. Here you decide how the email message will be formatted and how the email will be sent. Click add to save your operation details entries. Now, it’s time to test out your new email alerts. 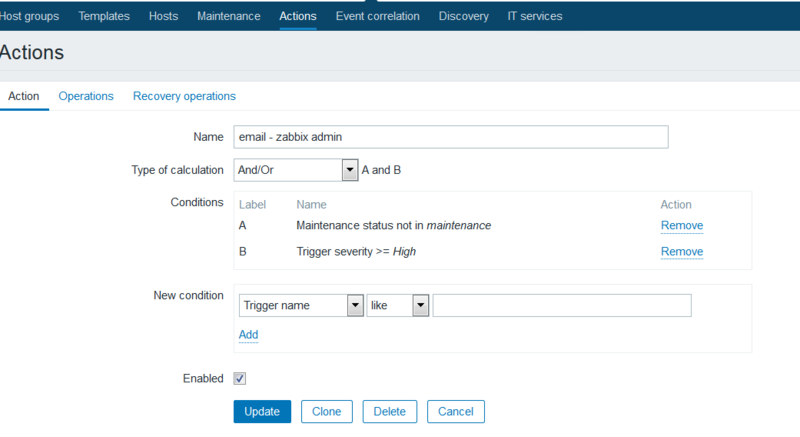 An easy way to test this is to stop a zabbix-agent service or otherwise activate a trigger that has a severity of at least High. If this is a lab test box, one trick I use regularly is to create an item that watches a file then set a trigger to alert when the file is missing. Now just create a file called /tmp/zabbix-trigger-test.txt on your host. When you want to test the trigger, simply rename/delete the file and the trigger will activate. Add the file back and the trigger goes to RESOLVED state. 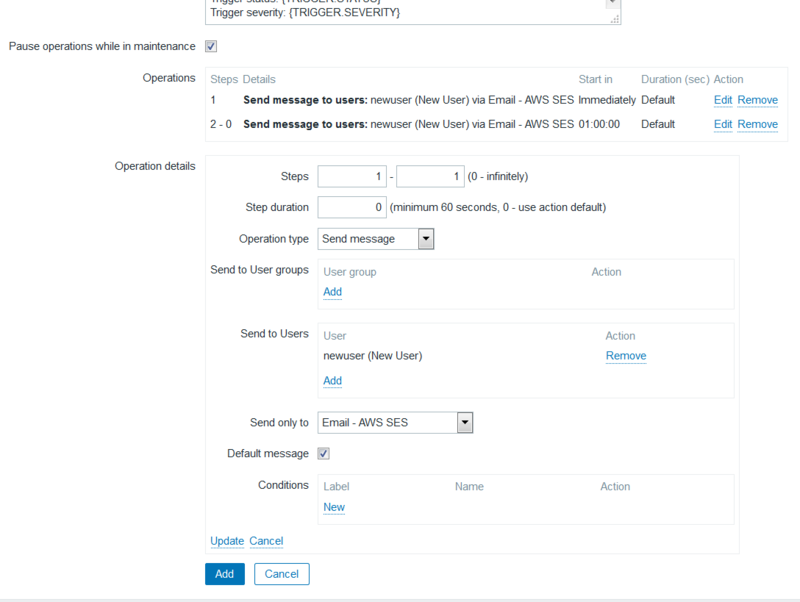 Troubleshooting the email send happens in Monitoring, Problems. Show Recent Problems and in the Actions column you will either see Done or Failures. Done is good and everything is working as expected. Failures will show an error message to help track down the issue. Click on Failures and hover over the ‘i’ to see what the error message is. You are on your own for figuring out what the error means. It’s most likely a wrong port or connection security on your media type, but you’ll have to track it down. This write-up, in general, will work with any SMTP server you’d like to connect to. I hope this helps someone get their email alerts working in Zabbix. AWS S3 has been around for a long time now. Yet, I am just now getting around to using it for an off-site backup location. Here’s my plan. Backup to local RAID disk on my backup server, then make an off-site copy up to S3. In my mind, this covers the 3-2-1 backup rule. Here’s how I see it broken down. Reach out if you think my thought process is off. 3 copies: The first copy is your primary data, second copy is the local backup on your backup server, and the 3rd copy is what gets put into S3. 2 media types: This is where I might be off. One is the local backup and the second is S3. I question this a little because I’ve seen out there on the internet where some are talking about different physical media types, but I think that is overly redundant as long as you ensure that your off-site backup is secure. IE: first is hard drive so second can’t be hard drive. What do you think? 1 off-site copy: The copy out to S3. This seems like a pretty solid backup policy. The -f switch is helpful to run the process in the foreground to troubleshoot mounting. Once you confirm the mount is successful, you can enter the mount attributes in /etc/fstab so it mounts at startup. Set up your backup client to put an extra copy in your /mnt/s3fs-bucketname directory. If you were really paranoid about data loss, you could always age your data in S3 to send it to Glacier at a certain time. I need to run with this for a little while and see what works best for my use case. Let me know if this works for you. rake requires Ruby version >= 1.9.3. Seems newer versions of rack and passenger are looking for more recent versions of Ruby than what is installed via CentOS/RHEL RPMs. I haven’t needed to upgrade Ruby beyond the version that the installed RPMs provide, so I needed to research a bit to get past this road block. I found a utility called RVM (Ruby Version Manager) that can be used quite easily to upgrade Ruby to pretty much any version you need. I chose to install the latest stable version of Ruby. RVM also allows you to have multiple versions of Ruby installed on your system and quickly switch between them. It’s that easy! Once I updated Ruby to the latest version I was able to successfully install both Rack and Passenger. Problem solved! This describes configuring OpenBSD server specifically, but the sshd_config settings should work on any distro. The result will be users with sftp only privileges where upon login they will be jailed into a directory and only have write access to a subdirectory. A quick and dirty bash script to configure the user directories. User will not be allowed to write to their home directory, but they will be allowed to write to the ‘upload’ subdirectory. Users will have read-only access to their home directory. Puppet is very particular about the Ruby version on Windows. While 2.2 and 2.3 versions of Ruby are available, puppet only runs without complaint on Ruby 2.1 on my Windows 7 box. As of May 2016, I installed ruby 2.1.8 and puppet-agent 3.8.7. I also had to install some gems to make puppet-agent happy. No issues if the right version of ruby and the right gems. The standard way of checking a service in Zabbix checks that the service is running, but I wanted to know not only that the NTPD service was running but that the time was synchronized. ntpstat is a great utility that does both, checks that the ntpd service is running and then tells you whether the server is synchronized. ntpstat will report the synchronization state of the NTP daemon running on the local machine. ntpstat returns 0 if clock is synchronized. ntpstat returns 1 if clock is not synchronized. ntpstat returns 2 if clock state is unknown, for example if ntpd can’t be contacted. The first way to use ntpstat with Zabbix is to simply create an item using the system.run function. Ensure EnableRemoteCommands=1 is set in your zabbix_agentd.conf file for this to work. I like creating new userparameter files for custom parameters. UserParameter=custom.net.ntpstat,ntpstat &> /dev/null ; echo $? Once your custom userparameter file is placed you’ll need to restart the zabbix agent. The last step with either item creation option is to create a trigger that alerts when the returned value is not 0. I like this check much better than my original one that just alerted when the ntpd service was down. Now I get alerted before time synchronization issues become an issue for the applications. This was tested on both CentOS 6.7 and CentOS 7.1, but this should work on your Linux distro of choice as long as you have ntpstat installed.